I’m in the middle of working on this page. Should have it done over the next few days. Then just a general page on German cyclemotors to do (ie those not covered with their own page) and I’ll move on to French machines. The German company Sachs was founded in 1895 to manufacture bicycle parts. The brochure below is from 1901. The 1902 picture below explains about the Fichtel & Sachs hub. The company built up an excellent reputation supplying bicycle and motorcycle manufacturers with the various parts they made, such as their world-famous Torpedo coaster hub. As you can see in the 1929 booklet above, they’d made 25 million Torpedo coaster hubs by this time. By the end of the 1920s, they saw a potential for cheap motorized lightweight motorcycles. There were 12.5 million cyclists in Germany alone. With their distribution network already established, it obviously made good sense for them to tool up for an engine that could be fitted to a bicycle. Fritz Gockerell sold them some patents; but rather than a front-mounted engine like his Rekord or the NSU Motosulm, which a purchaser could fit to their own bicycle, Sachs followed the example of Villiers in Great Britain and developed an engine that motorcycle/ bicycle manufacturers would fit themselves so they could badge the machine as their own product. They produced their first motorcycle engine in 1930, a 74cc engine that could be fitted centrally. This gave it the appearance of a conventional motorcycle, which meant that the manufacturers could ask a higher price for their product. The image above shows a 1935 Batavus with the 74cc engine. (Batavus is a Dutch company). By 1932 they had added a 98cc version to their range. The photo above is of the 98cc ‘Model 1932’ engine, as it was known, sported by my 1935 Triumph. Although the Triumph is a pedal-start, some of the 98cc engines had a kickstart, such as the one fitted into Sachs own very handsome motorcycle, illustrated below. Nobody, as far as I know, has yet issued a definitive figure of how many manufacturers used this proprietary engine: I’ve seen an estimate of 30 German companies and 33 foreign manufacturers. In addition, Fichtel & Sachs made stationary engines and outboard motors. The prospect above is for the 1936 Fichtel & Sachs outboard motor. Up to 1945 Fichtel & Sachs made around 750,000 of the 98cc engines. And between 1945 and 1950 another 50,000 or so were made. In 1950 a slightly modified version replaced the original; it was known as the ‘Model 1950.’ You can see an example of this engine below in one of my French motorcycles. But I’ve mainly focused in this page on the pre-war models, such as the the 1936 Phanomen range pictured in the gaudy brochure below. In 1937, Fichtel & Sachs introduced a cycle-attachment engine called the Saxonette. It fitted on the nearside of the rear-wheel similar in style to the postwar Victoria FM 38, although Sachs’ engine was 60cc. It did not sell very well. Because of the War, production ended in 1939. It is similar to the Saxonette engine that you can still buy new. (See the sections below for more details of both the pre-war and modern versions). My baby Triumph illustrates how each German motorcycle/ bicycle manufacturer of the thirties could easily use the Fichtel & Sachs engine to add a lightweight machine to their model range. This Triumph is quite unique. Without an idea of scale, at first glance you might assume it to be a 1920’s flat-tank Triumph. It quite surprised me at first how much it drove like one. Obviously it’s a lightweight, so it’s very much easier to manage than an old flat-tank; but the high ride-height and throttle lever are similar, and the two-speed 98cc Fichtel & Sachs engine definitely chugs along doing an excellent impersonation of a twenties motorcycle. The engine that came with the bike had not run for 12 years. But it had been restored at some stage in its life and it was not too difficult to get it going again. I’ve not managed to locate any brochures illustrating this precise model, with the flat tank; it’s very rare even in Germany. These brochures are for the 1938 Triumph (above) and 1936 Triumph 98cc models. When the Fenton Zip sidecar is fitted, the size of the Triumph can be even more confusing to work out. The Zip is a juvenile sidecar, manufactured by the Yorkshire company in 1931. As well as the Triumph with the earlier ‘Model 1932’ engine, I have a motorcycle with the later ‘Model 1950’ engine. It’s a 1951 French Narcisse. These two photos show it before restoration. I located another Model 1950 engine in France that had an exhaust system with it. Of course, the exhaust wasn’t for a tandem version of the Sachs 98cc engine, but we managed to adapt it with some extra tubing. We made a good engine out of the two. It has lots of interesting design features, but my favourite is the petrol tank, which is an integral part of the machine. The Narcisse company were based at 24 rue Alphonse Helbronner, St Ouen, Paris. German companies that used the Fichtel & Sachs 74cc or 98cc engine in the 1930s included Adler, Batavus, Bauer, Bastert, Blucher, Brennabor, BSW, Diamant, Durkopp, Elfa, Esweco, Excelsior, Express, Fels, Goricke, Hercules, HMW, Meister, Miele, National/Hainsberg, Panther, Phanomen, Reform, Sachs, Sparta, Torpedo, Triumph, Urania, Victoria, Wanderer. I’ll add to this list if I come across any more. By the way, you might wonder if I’m a bit off the track covering these motorcycles in what is essentially a Cyclemaster Museum. 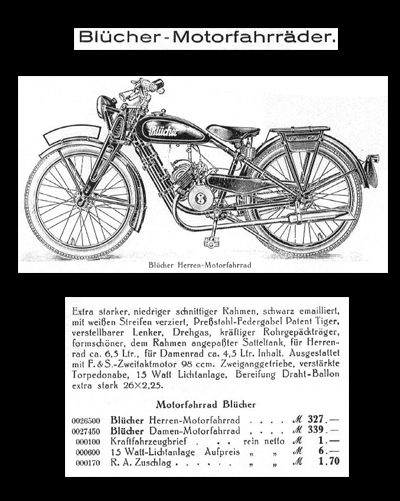 I must admit I have an interest in pre-war German bikes with Fichtel & Sachs engines, so I don’t need much excuse to research them and write up their history. But the Cyclemaster was a German invention, developed by engineers working on a small DKW engine. They obviously knew how the popularity and success of the Fichtel & Sachs 74cc and 98cc engines in the 1930s revolutionized transport in Germany. Just as autocycles in Great Britain were a ‘bridge’ between bicycles and motorcycles, the Sachs-powered pedal-assisted machines enabled ordinary working-class people to get motorized. This engine is not dissimilar to a cycle-attachment engine, as the lightweight motorcycles were essentially beefed-up bicycles, the ancestors of mopeds; they were simply factory-fitted rather than sold directly to the public. The developers would also have observed how the equally successful NSU Quick 98cc replaced the less-than-successful NSU Motosulm cycle-attachment unit in 1935. And they would have known of the difficulties of the Saxonette cycle-attachment engine. The Cyclemaster engine would undoubtedly have been designed with the success of the Fichtel & Sachs engine in mind, but using the concept of the Saxonette. The partnership of Hercules and Sachs began as early as 1905, when Ernst Sachs invented the torpedo brake hub which provided a revolution in bicycle manufacture – and in bicycle sales. Hercules sold motorcycles fitted with a variety of manufacturer’s engines. The photo above is from 1930. When Sachs introduced the 74cc engine, the two companies again combined to provide all the necessary post-sales requirements such as dealer-training and customer service. Although (as we’ve discussed in other pages) cycle-attachment engines had been manufactured pre-war, the Saxonette ‘help-motor’ was a very refined version. As it was put on the market in 1938 it was essentially the first of what we could describe as the post-war style of cyclemotor. The rear-mounted engine was built around the Sachs Torpedo hub, similar to the BSA Winged Wheel. Anker-Werke, Assmann, Bauer & Co., Bismarck AG, Brennabor-Werke, Brüsselbach, Dürkopp-Werke, Exelsior-Werke, Göricke, Gritzner-Kayser, Hainsberger Metallwerke, Hercules, Meister, Miele & Cie, Panther, Patria-WKC, Presto, Rixe & Co., Torpedo, Urania-Fahrradwerke, Victoria, Walther & Co., Wanderer-Werke AG. The bicycle factories supplied their own petrol tanks; but it was also possible to buy the engine/wheel direct from Saxonette and fit it to your own bicycle with a 26″ wheel. Some companies provided a wide range of colours for their bicycles fitted with the Saxonette. However, despite Fichtel & Sachs excellent reputation – they were renowned for extensive and continuous testing of their products – the new 60cc engine had many problems and not many were sold. A circular was issued to customers in August 1938 to explain some of the issues. The engine had been tested by the factory under full load. However the engine was less likely to be ridden by purchasers under full load, so the plug was likely to oil up. Bosch developed a new spark plug for it, the W95T1. As it was fitted to a variety of frames, the factory could not test the engine with them all; the ignition cable could rub against some frames, become porous and short-circuit. A protective tube was issued. Carburettor seals, nozzles, petrol pipes and filters were inefficient. The carburettor required cleaning and basic maintenance. People had problems with the twist grips. It had a pressure point to avoid the speed exceeding 25 kph (the speed that the factory deemed safe on a bicycle). Customers were generally not sufficiently technically-minded to deal with these issues themselves, and this caused real problems for dealers selling the Saxonette. If war had not interrupted its manufacture, it’s possible that Sachs would have redeveloped their engines and might have dominated the cycle-attachment market in the same way as they did with lightweight motorcycle engines. The illustration above shows the Hercules Gents bicycle fitted with the 60cc Saxonette engine; a Ladies/Gents version is illustrated below. After the War, Hercules/Sachs were ideally set up for distribution abroad, and most Sachs engined mopeds used the Hercules name. Interestingly, Great Britain already had a well-established bicycle manufacturing company called Hercules, that was not connected to the German marque. When The British Hercules company introduced their own moped in 1954 – they claimed it to be Britain’s first home-built moped – they had to change its name from the ‘Hercules Grey Wolf’ (the name used when it was launched) to ‘Her-cu-Motor.’ You can see a picture of my original Grey Wolf below; it uses a JAP engine. When the postwar German Hercules R200 Scooter was sold in Great Britain, it was also rebadged as a Prior, with the model name Viscount. It had been developed by the German Triumph company (TWN). The Prior Viscount had a Sachs 200 engine, which was also fitted to the Messerschmitt (the Viscount below is a 1959 model). The Prior name was also used for some exported Hercules/Sachs mopeds. And what about the competition? There were not many German companies pre-war who produced their own 98cc engines in the face of competition from Fichtel & Sachs and NSU. The 98cc NSU Quick (above) sold very well – 253,000 were made between 1935 and 1953. DKW deserve a section of their own as, of course, the Cyclemaster was originally designed by DKW engineers and the wartime developments of the DKW 2-stroke engine were impounded by the Allies. In Britain, their 125cc engine became the BSA Bantam’s engine, and the 200cc designs became the engine fitted to the Ariel Arrow and Leader. The 97cc DKW RT 100 (above and below) was technically advanced like DKW’s other 2-stroke engines. It had a 3-speed gearbox and top speed of 60 kph. It was introduced in 1934 and replaced by the RT125 in 1939. Motorenwerke Rasmussen was created by J. S. Rasmussen in 1906, in Zschopau, Germany. The first motorcycle was not made until 1921 and the name DKW was established the following year. Eventually DKW would become one of the world’s largest motorcycle manufacturers. By the end of the twenties their annual production level was around 65,000 engines: they rivaled Fichtel & Sachs for the supply of proprietary engines to German motorcycle manufacturers. In the 1930s, DKW designed a 118cc cyclemotor engine, which they had developed from an engine they fitted to a childs toy car. But by this time, they could observe NSU’s Motosulm. Fichtel & Sachs already dominated the market supplying 98cc engines to manufacturers; and JLO competed too. As a result, both large manufacturers and small assembly plants offered dozens of 98cc motorcycles to the public. The time was not right to market either a cycle-attachment engine or an engine under 100cc, so DKW focussed on ‘proper’ motorcycles with kick-starts and larger engine capacities. in 1932, DKW merged with Audi, Horch and Wanderer and became Auto Union; in the 1950s Victoria and Express joined and the new company was called Zweirad-Union. In 1965 they were absorbed by Sachs. Sachs still make cycle-attachment engines! Here’s a typical Saxonette/ Spartamet cycle with a modern Sachs engine. This one is in Holland, and it is interesting to browse the details on its sales/ import papers.